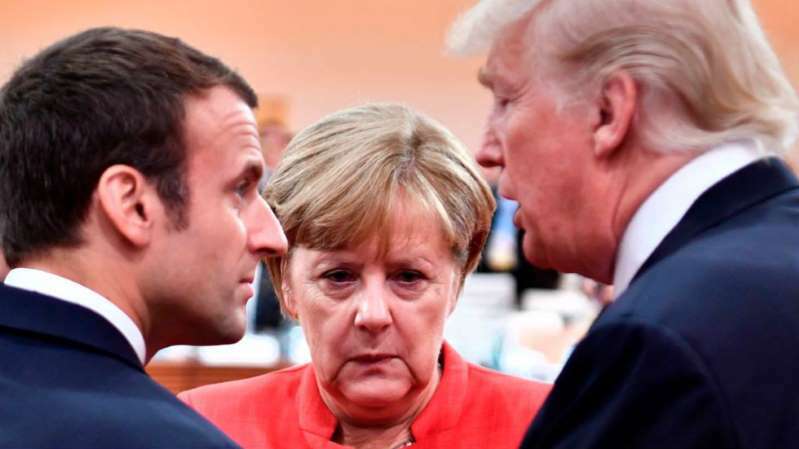 German Chancellor Angela Merkel said in a new interview Sunday that the European Union (EU) would follow Canada's move and forge ahead with its plan to implement counter-measures in response to President Trump's decision to levy tariffs on the 28-member bloc. "We won't allow ourselves be ripped off again and again. We will act too," Merkel told German broadcaster ARD. The chancellor also addressed concerns that Trump would hit back by implementing new tariffs on German vehicles, saying, "We will try to see if we can stop this from happening... And then hopefully the EU will respond again in the same unified way." Her comments came amid the escalating fallout from a contentious meeting between Trump and other world leaders at the Group of Seven (G-7) Summit in Canada over the weekend. Trump left the meeting between the world's leading industrialized countries with a warning to U.S. allies, saying that if they don't remove trade barriers with the U.S. then they will face consequences. Later on Saturday, after Canadian Prime Minister Justin Trudeau said all seven nations had signed a joint communique at the end of the summit, Trump angrily lashed out on Twitter, stating the U.S. would not endorse the statement. "Based on Justin's false statements at his news conference, and the fact that Canada is charging massive Tariffs to our U.S. farmers, workers and companies, I have instructed our U.S. Reps not to endorse the Communique as we look at Tariffs on automobiles flooding the U.S. Market!" Trump tweeted. His comment sparked a new diplomatic spat between Trudeau and the Trump administration and led Merkel to criticize the U.S. president's handling of the matter. "The withdrawal by tweet is of course sobering and a bit depressing," she said. She also spoke about Trump's suggestion that Russia be readmitted to the G-7, from which it was booted after its annexation of Crimea from Ukraine in 2014. Merkel said that while she could imagine such a scenario in the future, Moscow would first have to make real progress on a viable peace plan for the country. The German chancellor's comments on Sunday come after Trudeau announced that Canada would implement its own retaliatory tariffs on the U.S. Trump had given Canada, the EU and Mexico temporary exemptions from the steel and aluminum tariffs he first announced in March, but said at the end of May that he would be ending the exemptions.